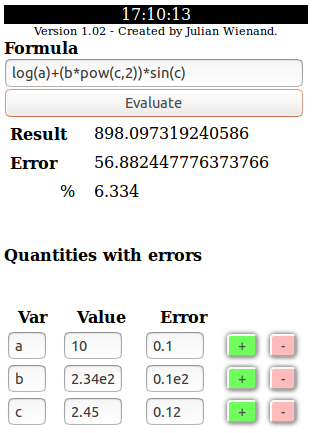 This tool helps you to determine the uncertainty (or error) of any mathematical expression that contains physical quantities with uncertainties. It follows the rules of the Gaussian error propagation: If f is a function of the independent variables X and Y, written as f(X,Y), then the uncertainty in f is obtained by taking the partial derivatives of f with respect to each variable, multiplication with the uncertainty in that variable, and addition of these individual terms in quadrature. Use "." as decimal mark: 1.234, not 1,234. Enter a valid formula using the functions listed at the bottom. In the "quantities with errors" section define all variables which appear in your formula. Use "." as decimal mark, not ",". Hit evaluate and get the result along with its absolute and relative uncertainty. Keep in mind that this tool carries out numerical calculations which do not have the same value as analytical methods. However, in all known cases the deviations between numerical and analytical results were negligibly small. Furthermore Euler's constant and Pi are represented by "E" and PI" respectively.